"I don't think I want to live if I have to go on feeling like this." I hear this remark all too often from anxiety sufferers. They say it matter-of-factly or dramatically, but they all feel the same way: if anxiety symptoms are going to rule their lives, then their lives don't seem worth living. Of course, therapists know that eliminating symptomatology isn't the same as eliminating etiology. Underlying psychological causes or triggers for anxiety, such as those stemming from trauma, aren't the target of management techniques; they require longer-term psychotherapy. However, anxiety-management techniques can offer relief, and offer it very speedily. Method 1: Manage the Body. Telling anxiety-prone clients to take care of their bodies by eating right, avoiding alcohol, nicotine, sugar, and caffeine, and exercising is a strikingly ordinary "prescription," but not doing these things can undermine the effectiveness of other antianxiety techniques. Therapists who remember that humans have bodies as well as minds are much likelier to inquire routinely about ongoing self-care, including sleep and exercise. They're also more willing to help clients overcome their reluctance to follow a self-care routine. A tip to remember for female clients who experience a resurgence of symptoms in spite of the fact that they're managing their body is to consider hormonal changes. Pregnancy, postpartum changes, hysterectomy, and interruptions in cycles may contribute to anxiety. The slow process of menopause, which may begin over a wide range of ages, is another factor to consider. Shifts in thyroid function also contribute to shifts in anxiety. They can occur at any age, and predominate in female clients. Therapists need to be particularly alert to what might be going on in the body when a client who was previously doing well starts having trouble. I've often found that when clients say that breathing "doesn't work," it's because they haven't learned to do it correctly. Or once having learned it, they've given it up when they felt better, believing that they no longer needed to do it. By the time they feel anxiety returning, they're convinced that something so simple can't possibly be really effective. Therefore, it's important for therapists to emphasize and reemphasize that breathing will slow down or stop the stress response, if the client will just do it. A wonderful technique, this simple "mindful awareness" exercise has two simple steps, repeated several times. 1. Clients close their eyes and breathe, noticing the body, how the intake of air feels, how the heart beats, what sensations they have in the gut, etc. 2. With their eyes still closed, clients purposefully shift their awareness away from their bodies to everything they can hear or smell or feel through their skin. By shifting awareness back and forth several times between what's going on in their bodies and what's going on around them, clients learn in a physical way that they can control what aspects of their world--internal or external--they'll notice. This gives them an internal locus of control, showing them that when they can ignore physical sensations, they can stop making the catastrophic interpretations that actually bring on panic or worry. It's a simple technique, which allows them to feel more in control as they stay mindful of the present. Method 4: Don't Listen When Worry Calls Your Name. Few realize that the feeling of dread is just the emotional manifestation of physical tension. This "Don't Listen" method decreases this tension by combining a decision to ignore the voice of worry with a cue for the relaxation state. Early in treatment, generalized anxiety disorder (GAD) clients learn progressive muscle relaxation to get relief. I always teach them how to cue up relaxation several times throughout the day by drawing a breath and remembering how they feel at the end of the relaxation exercise. We usually pair that deeply relaxed state with a color, image, and word to strengthen associations with muscle relaxation and make it easier to cue the sensation at will. We then use that ability to relax to counteract the voice of worry. Clients must first learn that worry is a habit with a neurobiological underpinning. Even when a person isn't particularly worried about anything, an anxiety-prone brain can create a sense of doom, which then causes hypervigilance as the person tries to figure out what's wrong. Method 5: Knowing, Not Showing, Anger. Anger can be so anxiety-provoking that a client may not allow himself to know he's angry. I often find that clients with GAD have an undetected fear of being angry. When a client fears anger because of past experience—when she remembers the terrifying rage of a parent, or was severely condemned for showing any anger herself—the very feeling of anger, even though it remains unconscious, can produce anxiety. 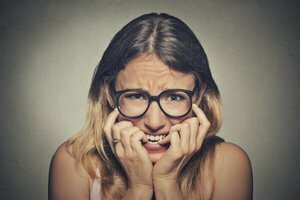 The key to relieving this kind of anxiety is to decrease the client's sense of tension and stress, while raising the consciousness of anger so that it can be dealt with in therapy. I've found that simply being able to feel and admit to anger in sessions, and to begin working on how to safely express it, diminishes anxiety. I tell clients, "To know you're angry doesn't require you to show you're angry." The technique is simple. I instruct clients that the next time they're stricken with anxiety, they should immediately sit down and write as many answers as possible to this specific question, "If I were angry, what might I be angry about?" I tell them to restrict their answers to single words or brief phrases. The hypothetical nature of the question is a key feature, because it doesn't make them feel committed to the idea that they're angry. They may destroy the list or bring it in for discussion, but I ask them to at least tell me their reactions to writing this list. Without fail, this exercise has helped some of my anxious clients begin to get insight into the connection between their anger and their anxiety, which opens the door to deeper levels of psychotherapy that can resolve long-standing anger issues. Method 6: Have a Little Fun. Laughing is a great way to increase good feelings and discharge tension. The problem for anxious clients is that they take life so seriously that they stop creating fun in their lives, and they stop experiencing life's humorous moments. Everything becomes a potential problem, rather than a way to feel joy or delight. Fun-starved clients sometimes need a "prescription," like "Take two hours of comedy club and mix with a special friend, once a week" or "Plan one weekend out of town with your husband every two months." Not surprisingly, tightly wired workaholics initially need to make fun a serious goal of treatment, something to be pursued with some of the same doggedness they put into work. But once they actually find themselves laughing and enjoying themselves, they become less tightly wired, less dogged, and more carefree. Laughter itself is one of the best "medications" of all for tension and anxiety. Method 7: Turning It Off. From Eugene Gendlin's Focusing method, I've borrowed the concept of "clearing space" to turn off and quiet the ruminative mind. I ask the client to sit quietly with eyes closed and focus on an image of an open container ready to receive every issue on his or her mind. She's then instructed to see and name each issue or worry, and imagine putting it into the container. When no more issues come to mind, I suggest that the client mentally "put a lid" on the container and place it on a shelf or in some other out of the way place until she needs to go back to get something from it. Once the jar is on the shelf, the client invites into the space left in her mind whatever is the most important current thought or feeling. Perhaps she's at the office and needs to think about a work-related issue, or she needs to shop and should plan what she'll buy, or she's with friends and wants to focus on what they're saying. At night, right before sleep, the client is asked to invite a peaceful thought to focus on while drifting off. Method 8: Persistent Interruption of Rumination. Ruminative worry has a life of its own, consistently interfering with every other thought in your client's mind. Thought-stopping/thought-replacing is the most effective cognitive-therapy technique for interrupting chronic rumination, but I find the key to making it work is persistence. Clients very quickly pick up on the technique itself, but they're always shocked by how rumination can subvert all their good efforts, and by how persistently they have to keep at it to succeed. I've had clients come back and say the technique didn't work, because they'd tried it 20 to 30 times in a day and they still were ruminating. I tell them that they must do it every time they catch themselves ruminating, even if it is 1,000 times a day or more! That's what I mean by persistence. Method 9: Worry Well, But Only Once. Some worries just have to be faced head-on, and worrying about them the right way can help eliminate secondary, unnecessary worrying. The way to do this is to worry well—and only once. Here’s how that works. The client must: (1) worry through all the issues; (2) do anything that must be done at the present time; (3) set a time when it'll be necessary to think about the worry again; (4) write that time on a calendar; and (5) whenever the thought pops up again, say, "Stop! I already worried!" and divert her thoughts as quickly as possible to another activity. It's critical to this method to cover all the bases, but 10 minutes, surprisingly, is an adequate amount of time in which to do that. Method 10: Learn to Plan Instead of Worry. A big difference between planning and worrying is that a good plan doesn't need constant review. An anxious brain, however, will reconsider a plan over and over to be sure it's the right plan. This is all just ruminating worry disguising itself as making a plan. Clients who ruminate about a worry always try to get rid of it by seeking the reassurance that it's unfounded. They believe that if they get the right kind of solution to their problem—the right piece of information or the best reassurance—they'll then be rid of the worry once and for all. They want to be absolutely sure, for example, that a minor mistake they made at work won't result in their being fired. In reality, however, a ruminating brain will simply find some flaw in the most fail-safe reassurance and set the client off on the track of seeking an even better one. One good way to get out of the reassurance trap is to use the fundamentals of planning. This simple but often overlooked skill can make a big difference in calming a ruminative mind. I teach people how to replace worrying with planning. For most, this includes: (1) concretely identifying a problem; (2) listing the problem-solving options; (3) picking one of the options; and (4) writing out a plan of action. To be successful with this approach, clients must also have learned to apply the thought-stopping/thought-replacing tools, or they'll turn planning into endless cycles of replanning. After they make a plan, ruminating clients will feel better for a few minutes and then start "reviewing the plan"—a standard mental trick of their anxiety disorder. The rumination makes them feel overwhelmed, which triggers their desire for reassurance. But when they've actually made the plan, they can use the fact that they have the plan as a concrete reassurance to prevent the round-robin of ruminative replanning. The plan becomes part of the thought-stopping statement, "Stop! I have a plan!" It also helps stop endless reassurance-seeking, because it provides written solutions even to problems the ruminator considered hopelessly complex. But the rewards of teaching people how to use these deceptively simple, undramatic, and ungimmicky methods are great. While clients in this culture have been indoctrinated to want and expect instantaneous relief from their discomfort at the pop of a pill, we can show them we have something better to offer. We can give people a lasting sense of their own power and competence by helping them learn to work actively with their own symptoms, to conquer anxiety through their own efforts--and do this in a nonmanipulative, respectful, engaging way. People like learning that they have some control over their feelings; it gives them more self-confidence to know they're not the slaves of physiological arousal or runaway mental patterns. And what we teach them is like playing the piano or riding a bicycle: they own it for life; it becomes a part of their human repertoire. What medication can make that claim? This blog is excerpted from "10 Best-Ever Anxiety-Management Techniques" by Margaret Wehrenberg. The full version is available in the September/October 2005 issue, Changing Your Mind: The New Brain Technologies and the Future of Psychotherapy. Read more FREE articles like this on Anxiety/Depression. In this busy world anxiety is obvious, but to lead a healthy and cheerful life we have to keep it away. Yes, Little avoidance to worries and having fun can perform a good job for you in this way. Well explained and nice blog. Thanks for sharing.